One day a while back a group of us got talking about exercise, workout routines, and gym memberships. I listened and then told them I was using a system I called “Homesteader-cise”. After some laughing and a couple of teasing comments I got the opportunity to explain to them what it was all about. I want to share that with you. 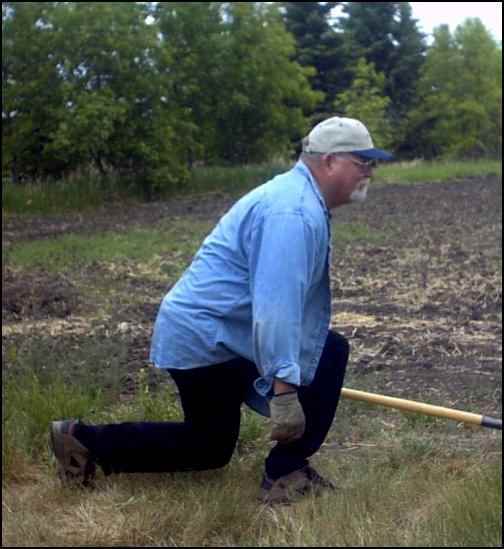 HOMESTEADER-CISE: Exercises, fitness, strength training and fun that are a part of the homestead/rural lifestyle, using the normal everyday equipment and tools that every homestead has. Why is it even necessary to talk about fitness and exercise? The National Center for Health Statistics tells us that just 30% of Americans are physically active (30 minutes a day, 3 times a week) and almost 4 out of 10 are sedentary (less than 10 minutes of activity in a two week period). Data from the Center for Disease Control in Atlanta says that since the mid-seventies there has been a huge upswing in the prevalence of overweight and obesity for both adults and children. With adults aged 20–74 years the prevalence of obesity increased from 15.0% to 32.9% in the last twenty years. Over the last 50 years, so many things have gotten in the way of a healthy lifestyle. Much of modern living interferes with good health and fitness, from the commuting time to work, to watching too much TV (4 hours 35 minutes per day on average), to far less physical work for most people. We, as homesteaders, are on the right path to improved physical fitness and health. The chores of the homestead, the daily routine, the normal lifting, stretching, carrying, hauling, and pushing are an easy way to ongoing fitness and health. This is fitness as a lifestyle choice. Meanwhile, back at the homestead…..
First you have to get your workout gear on…… spandex shorts… NOPE. Form-fitting tank top… NOPE. $180 Nike cross-trainers…. FOR SURE NOPE. For our workout it is very simple… Jeans, T-shirt or denim work shirt, steel-toed work boots (or rubber boots if it is muddy), work gloves and a bandanna or ball cap… that is it, all set. Next, to the gym… no sweaty, smelly gym for us! We just step out the front door, take a deep breath and there it is… the whole place is the gym. Exercises and activities performed outdoors in fresh air offer increased aerobic benefits. More clean air in helps improve our breathing technique. Better technique increases stamina. More oxygen to the muscles reduces that lactic acid build-up in the muscles. What about the fitness equipment? Well, it is all right there, too. Shovel, rake, hoe, wheelbarrow, bow-saw, hay bale, the pile of rocks, and the expanse of grass with the lawn mower, as well as sheep and goats to chase. Of course, don’t forget the (grand)kids to play tag with, or to chase and keep up with. Gardens to be weeded, fences to be built, and the endless list of the thousand things that have to be done on the homestead. Oh! And did I mention rocks? A whole bunch of rocks. You no longer need to look at the rocks the same way. They are now an integral part of your exercise plan. There! Don’t you feel better just knowing that? 1. Stand upright with one foot far in front of the other. Feet apart comfortably, both facing ahead, not turned outward. 2. Bend both knees. Don’t let your front knee come forward, but keep it over the front ankle. 4. Your back heel comes up. Keep the front heel down for better knee health. It’s a free, built-in Achilles stretch, too. 5. Be careful not to touch your back knee to the floor, nor hold your hands on your front knee. Done properly, the lunge and the squat should not hurt your knees and will protect your back from injury. Bending correctly burns more calories than bending over improperly. Good bending is an added bonus for your weight loss program. The Squat is the perfect exercise to strengthen the Quads. 1. Step up to the wheelbarrow with feet flat on the ground and shoulder width apart. 2. Bend your knees and lower yourself with your back straight and head up until you are able to grasp the handles comfortably. 3. Now raise yourself up using only the thigh power, keeping your back straight until you are standing erect. 4. 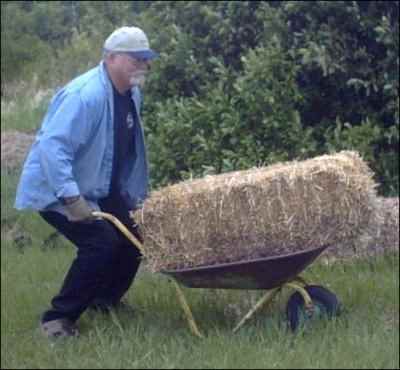 Now this time try it with stuff in the wheelbarrow. Use a 6-foot metal T post and a 3 lb. sledge hammer (a 20 ounce framing hammer can be substituted). 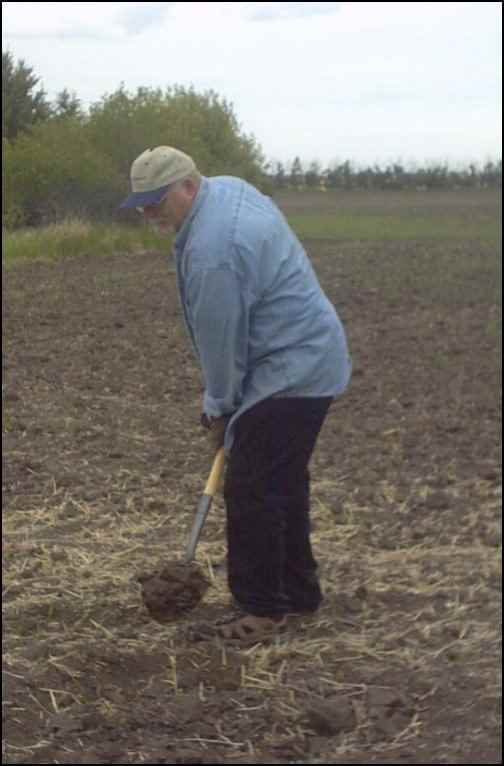 Hold the post straight and hammer it into the ground until you reach the desired depth. This is a combination exercise. 1. You start out like a squat. Grab the strings of the bale and then using your quads stand with the bale being held at waist level. 2. Next you lift the bale using your Biceps and Pecs (arms and chest) until the bale is resting on your open palm at eye level. 3. You then use the same technique that a volley ball setter would use. With one foot slightly ahead of the other, you bend your knees and as you rise you push with your arms and launch the bale up and out. 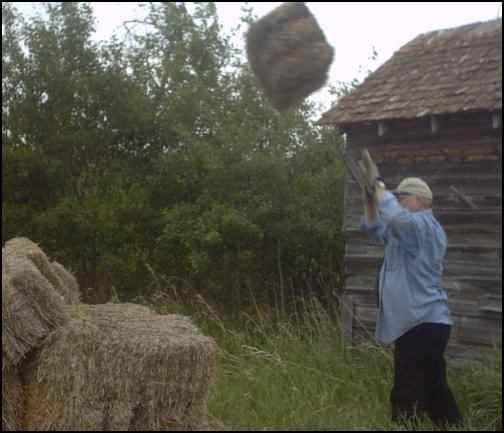 Did you know that they even have a Hay Bale Toss competition in Minnesota? Southeastern Minnesota Forage Council holds several annual events that include a hay bale toss for distance. Carry. Yep! you guessed it – you get to carry things. 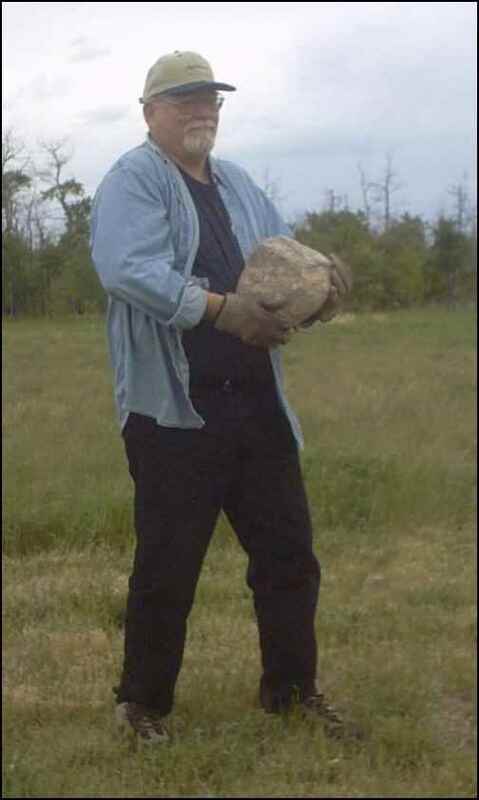 Important Note: Make sure that when you are picking up and lifting rocks that you always use proper form. Using either the lunge or the squat so that it is your legs and arms, not your back, that do the lifting. Water weighs 8 lbs per gallon, so a 5 gal bucket is 40 lbs. It would be better to use two pails, filling them half full and carry one on each side, this will improve the symmetry of the muscle development. Using the same technique as the Squat, you stand with feet shoulder width apart and lower yourself, keeping heels in contact with the ground, until you can grasp the handles, then raise yourself using your qauds. Once standing erect, the weight is carried by the Biceps and the shoulders. If you carry that much weight any distance you are developing muscles and burning calories. Gardening involves a number of different kinds of exercises, including stretching, weight lifting, and a moderate cardiovascular workout. National Gardening Magazine has been involved in studies related to how many calories you can burn while you garden and claims that 45 minutes worth of gardening can burn as many calories as 30 minutes of aerobics. They also talk about turning compost as a great alternative to lifting weights, and raking the lawn as the equivalent to using a rowing machine. Researchers at the University of Arkansas have linked regular yard work to the prevention of osteoporosis. It was found that women 50 and older, who gardened at least once a week, showed higher bone density readings (this is a very good thing) than those who performed other types of exercise. Walking is one of the best forms of exercise. It uses up oxygen, causing your body to burn stored fat, while, at the same time, being low impact and easy for anyone to do. In a recent study published in Medicine & Science in Sports and Exercise, they looked at the Amish community to see how a traditional farming/rural lifestyle, which shuns modern conveniences and power machinery, impacted their fitness levels. The Amish are mostly farmers and the men average 10 hours per day of physical work and 18,000+ steps per day (on a pedometer). This, compared to the average sedentary American who may only get 30 minutes per day of physical activity and takes around 5,000 steps a day. Only 4% of the Amish are obese (despite the fact that they eat diet high in calories, fat, and sugar) compared to the American obesity rate of 33%. Their weekly exercise was equivalent to that of long-distance runners. “The load lifted should be adjusted according to the shoveling rate. For a high rate of shoveling (about 15 scoops per minute) the total weight (weight of a shovel plus a shovel load) should not exceed 10 to 15 lbs. For a lower rate, the load can be increased to a maximum of about 24 lbs. Throw height should not exceed approximately 4 feet. The optimal throw distance is slightly over 3 feet. The load should be reduced if the task requires a longer throw”. Should you think that the simple everyday activities of the homestead are not enough to make a difference in your health and fitness….. think again. The work around the Homestead compares with any workout you would get at the gym and often is better for you and actually burns more calories than going to the gym. I was shopping in a thrift store recently, and made an observation. There was not a single shovel or hoe, rake or hammer, wheelbarrow or saw. But there were 2 Ab Blasters (not a new CD player, but a specialized exercise contraption to tone your abdominal muscles), 4 tennis racquets, 3 sets of golf clubs, one treadmill, a set of barbells and weights, a cross-country ski simulator, and 3 sets of aerobic steps. It made me wonder how much other fitness equipment is collecting dust in someone’s garage or basement. They would be so much better off if they just stepped outside and walked or gardened. If all the amazing healthful benefits of exercise and fresh air could be put into pill form and patented by a pharmaceutical company, we would all be on a prescription for this wonder drug. Regular exercise improves quality of life, sleep, appetite, sense of well-being and reduces the risk of heart disease, high blood pressure, diabetes, osteoporosis, anxiety, depression and cancer (especially colon and breast cancer). To steal a phrase from the shoe people….JUST DO IT!!!!!!! Medicine & Science in Sports and Exercise, the official journal of the American College of Sports Medicine.